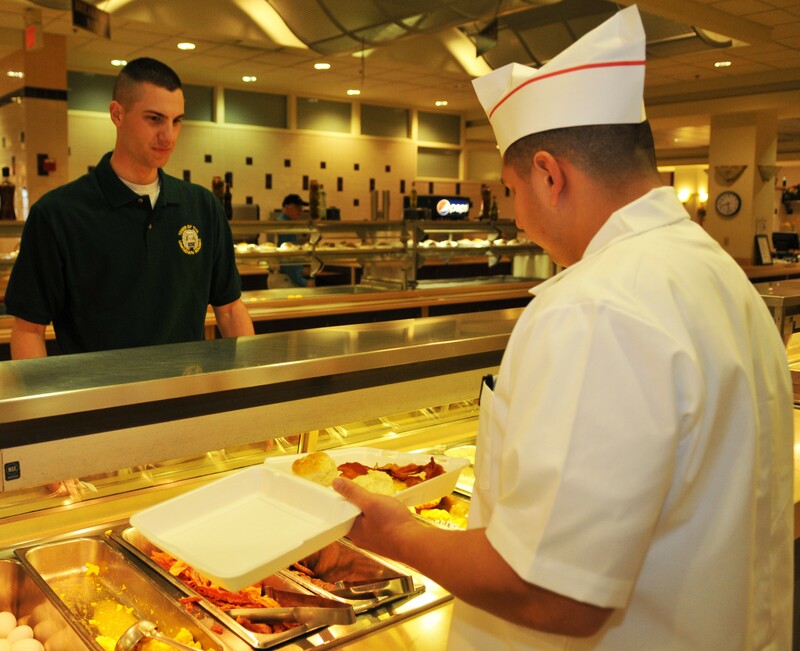 For the first time in more than 35 years, the Joint Base Myer-Henderson Hall, Va. dining facility is being operated by service members. 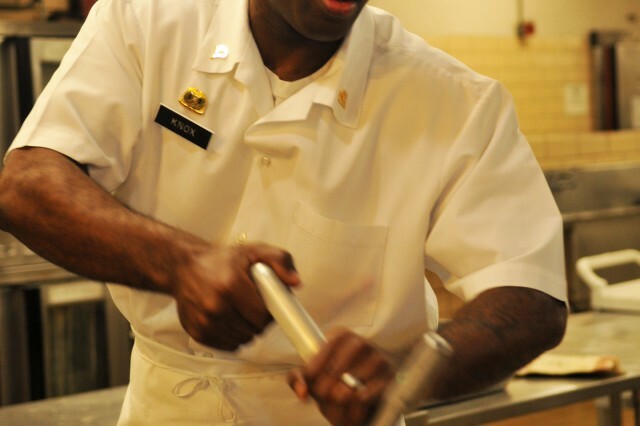 Food service specialists from The Old Guard's 529th Regimental Support Company relocated from Fort Leslie J. McNair last summer and have been eager to get back to work; on 1 April, they finally got the opportunity. "I am just so excited to be working to serve each and every person that walks through that door," said Spc. 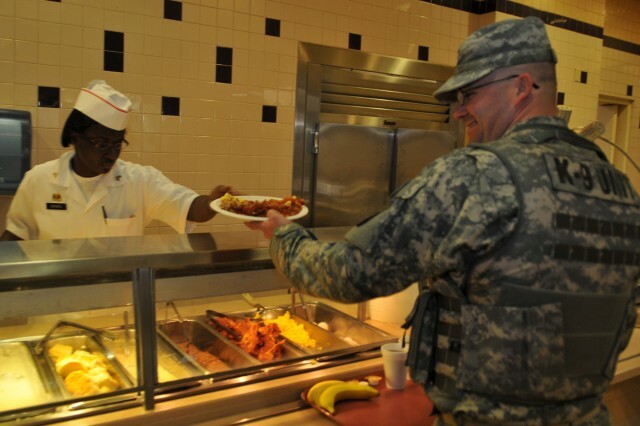 Kenyuan Knox, 529th RSC food service specialist, pointing in the direction of the DFAC's main entrance. 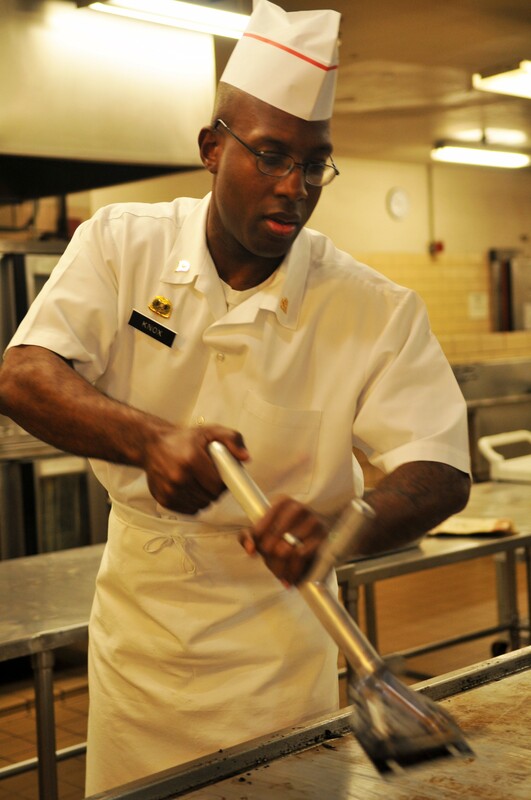 Knox, who's been a food service specialist for four years, says that he most enjoys his job for what the relationship between Soldiers and cooks represent. "We are Soldiers serving Soldiers, and serving them is a large responsibility that I am happy about," said Knox. "We wear the same uniform just like them, and when they see us, they can relate to us." Knox added he has experienced firsthand how important this link is for the morale of a unit. "I have seen how the meals we prepared send the morale of a platoon sky high when I was in Iraq," said Knox. "There is something genuine when we are serving food to hungry troops that I can't explain. It feels great." Food service specialist Pfc. Jason Cannor, who has been in the Army for just a few months, is just as excited about the opportunity to do his job. "I liked working in the food industry before I joined the Army, but the job is more rewarding and honorable for me now because almost all the folks that we cater to are military," said Cannor. "I have never been able to relate to a customer the way I have now." The experience is not only rewarding for the cooks, but is also rewarding for the service members that eat there. Pfc. Brett Hyde, Tomb Guard, Tomb of the Unknown Soldier, expressed a slight shock as he was going through the line and saw Soldiers preparing and serving the meals. "I was a little surprised to see Soldiers making the food when I walked in," said Brett. "I talked with one of the cooks as he was making some food about being a tomb guard. Not only was the food good, but we may have a potential tomb guard candidate in the works." Soto encourages communication between the customers and his Soldiers and hopes it will help ease the transition from the old management. Most importantly, Soto hopes the experience of eating in a DFAC fully operated by Soldiers will leave many with a different outlook on military food services. "I saw some smiles out there because they were happy to see us. 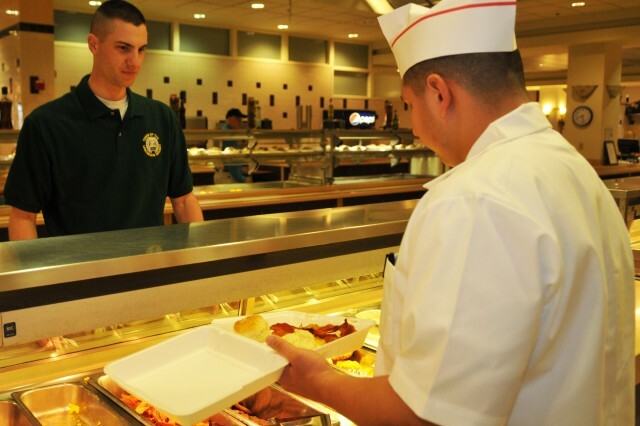 We want everyone to want to eat here and be excited about seeing Soldiers preparing their meals," said Soto, senior food operations specialist "From the president to a private, they will get the best quality food and service from us. I have some talented guys in the back, and we are putting in the work to make this place the best we can."